A Beast-drawn Man. 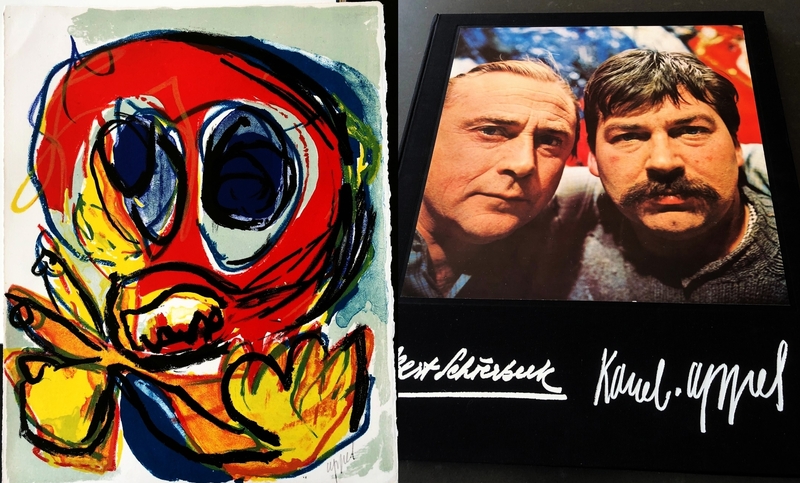 (With 7 original, signed color lithographs by Karel Appel). Amsterdam, De Bezige Bij, . 52 x 43 cm. 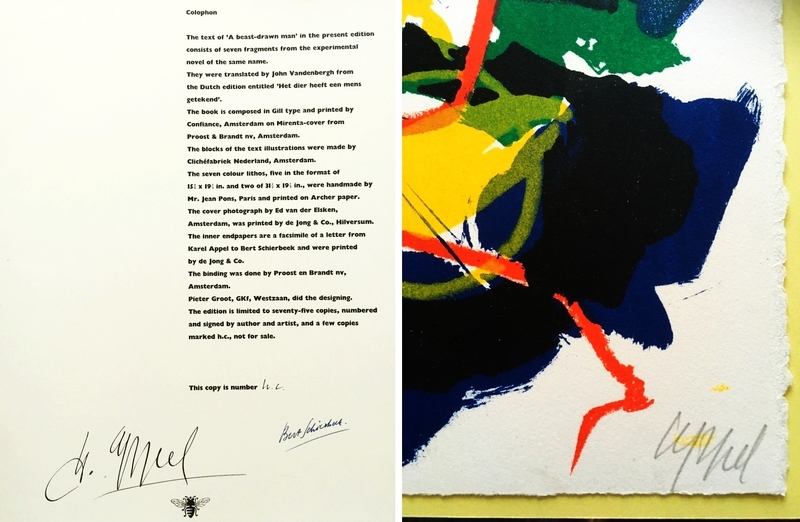 Original black cloth, decorated with a photographic portrait by Ed van der Elsken and the artists’ signatures in white blocking. In printed plastic slipcover (Proost & Brandt bookbinders). (40) p. Seven large lithographs, including two double-page size, loosely inserted, all signed by Appel in pencil, with silk protecting tissue. With eight drawings in black-and-white print. Typography Pieter Groot. Set from the Gill and printed by Confiance in 75 numbered copies, signed under the colophon by Appel and Schierbeek. The text and the eight ink drawings were printed on paper in varying colors. 1st edition. Trifling damage to the plastic sliding cover. Very fine. * Majestic artist’s book in huge format. 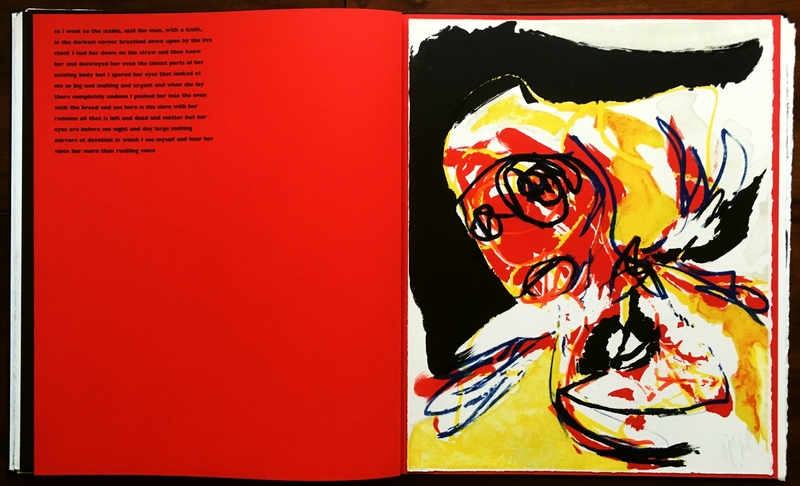 The seven full-page lithographs and the drawings attest the full force of Karel Appel’s imagination, triggered by Schierbeek’s poetical prose fragments. The translation into English is by John Vandenbergh (himself a giant, translating Ulysses into Dutch). Also with 8 printed drawings by Appel. This is one of the few hors-commerce copies. 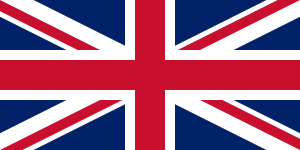 This international edition was, to the surprise of the publisher, a great sales success. In the first year nearly 60 copies were sold (original purchase price 1,000 hard silver guilders!). The (loosely inserted) lithographs were often sold separately. This copy is complete, even with its often missing original sliding cover, that protects the cloth excellently. Added separately: offset print of the portrait photo of Appel and Schierbeek by Ed van der Elsken decorating the upper cover. Karel APPEL & Hugo CLAUS De Blijde en Onvoorziene Week. 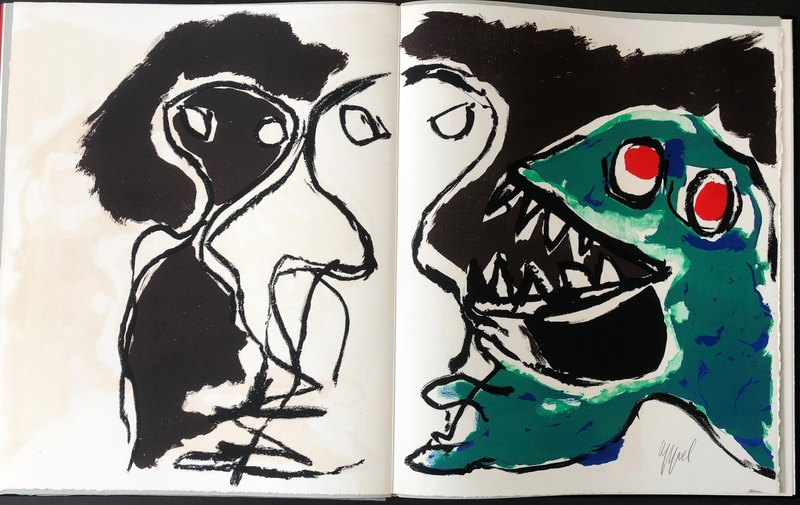 (With eight drawings by Karel Appel, hand-colored by himself). (Paris, Cobra, 1950). 27.4 x 22.3 cm. (16) p. in original wrappers. Printed in Paris in december 1950 in an edition of 200 numbered and signed copies (this is number 195). Original order form loosely inserted (with a drawing by Appe). 1st edition. Fine specimen. * Literally ‘The Happy and Unforeseen Week’. One of the great Cobra artist’s books. This Cobra book was written and drawn by Claus and Appel in a single creative afternoon in December, 1950 in their own spontaneous way. 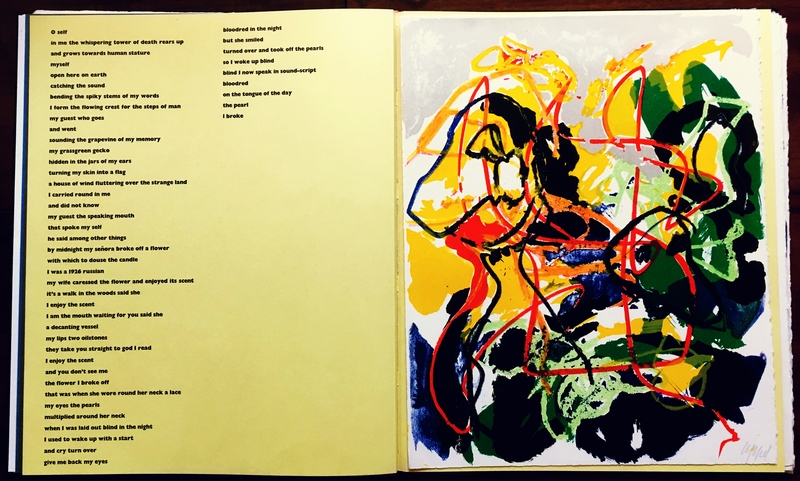 8 drawings by young Karel Appel in a few flashing moments, and the electric enthusiastic poetry of even younger Hugo Claus. These were multiplied (200 copies) in a primitive photocopy technique (it was long before the spread of commercial xerox machines) and then illuminated by Appel in primary colors. Both poet and artist signed the book. 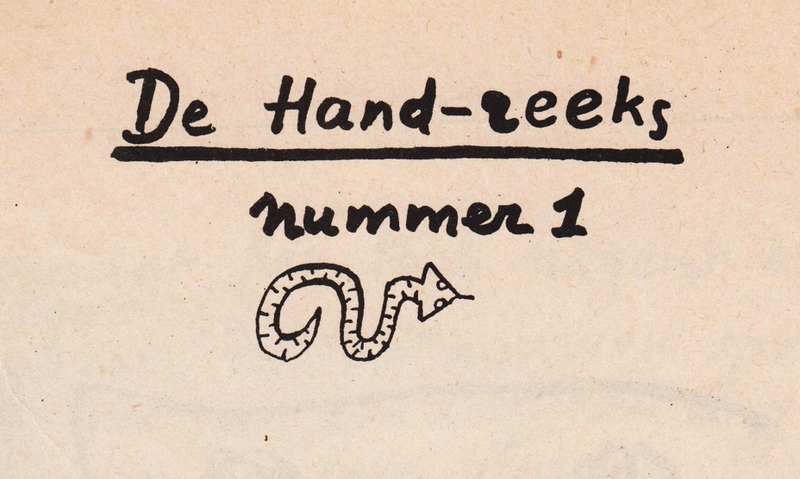 A series of these handmade books was envisaged, called De Hand Reeks (‘The Hand Series’), and this little miracle was Nr. 1. So – a great book was created in an incredible short time and with relatively low cost and effort, and the only obstacle was selling it, so more books of the Hand Series could be made. Karel Appel made a prospect, adorned with a drawing, and this was sent to possible subscribers (price: three Dutch guilders, 50 Belgian francs or 300 (old) French francs). Unfortunately, only three people subscribed. The project was a fiasco, no other electric afternoons anymore enjoyed for the designing of new Hand Series issues: De Blijde en Onvoorziene Week remained the only volume. De Hand-reeks 1. Slagter 11. 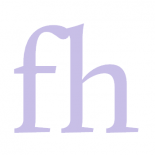 BHC 6.1.